Bangaii Cardinalfish is best kept in an aquarium that is no smaller than 30 gallon /120 L (a single specimen can be kept in a 20 gallon / 80 L tank). I recommend a larger aquarium if you want to keep a larger school of them. The aquarium should be decorated with overhangs and caves, and the overhangs should be large enough for all your Bangaii cardinalfish to spend the days in the shade under them. The fishes will also appreciate sea grass to hide among. In the wild, this species is often found hiding among the spines of sea urchins and they love if you can mimic these sea urchin spines in the aquarium. This is however not necessary to keep them. You can use whatever bottom substrate you see fit. Corals and anemones can be included in the decoration. 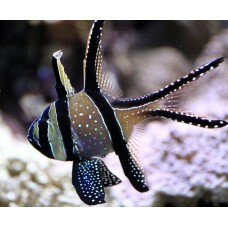 The Bangaii Cardinalfish prefers a softer lit aquarium that is well circulated. Ideal conditions for the Bangaii Cardinalfish is pH 8.1-8.4, salinity 1.020-1.025, and temperature 72-78ºF (22-26°C). The recommended water temperature when keeping Red Tomato Clownfish is 72-80° F (22-27° C), the pH-value should be kept in the 8.1-8.4 interval, and the specific gravity should be 1.020-1.025. A carbonate hardness of 8 - 12° dKH is ideal.